Don't Waste our future! World’s future food security “in jeopardy” due to multiple challenges, report warns - Don't Waste our future! Empowering small-scale farmers and providing them better access to information, markets and technologies is key to ensuring future food security. 22 February 2017, Rome – Mankind’s future ability to feed itself is in jeopardy due to intensifying pressures on natural resources, mounting inequality, and the fallout from a changing climate, warns a new FAO report out today. Though very real and significant progress in reducing global hunger has been achieved over the past 30 years, “expanding food production and economic growth have often come at a heavy cost to the natural environment,” says The Future of Food and Agriculture: Trends and Challenges. “Almost one half of the forests that once covered the Earth are now gone. Groundwater sources are being depleted rapidly. Biodiversity has been deeply eroded,” it notes. As a result, “planetary boundaries may well be surpassed, if current trends continue,” cautions FAO Director-General José Graziano da Silva in his introduction to the report. By 2050 humanity’s ranks will likely have grown to nearly 10 billion people. In a scenario with moderate economic growth, this population increase will push up global demand for agricultural products by 50 percent over present levels projects The Future of Food and Agriculture, intensifying pressures on already-strained natural resources. At the same time, greater numbers of people will be eating fewer cereals and larger amounts of meat, fruits, vegetables and processed food — a result of an ongoing global dietary transition that will further add to those pressures, driving more deforestation, land degradation, and greenhouse gas emissions. Alongside these trends, the planet’s changing climate will throw up additional hurdles. “Climate change will affect every aspect of food production,” the report says. These include greater variability of precipitation and increases in the frequency of droughts and floods. The core question raised by today’s FAO publication is whether, looking ahead, the world’s agriculture and food systems are capable of sustainably meeting the needs of a burgeoning global population. Without a push to invest in and retool food systems, far too many people will still be hungry in 2030 — the year by which the new Sustainable Development Goals (SDG) agenda has targeted the eradication of chronic food insecurity and malnutrition, the report warns. “Without additional efforts to promote pro-poor development, reduce inequalities and protect vulnerable people, more than 600 million people would still be undernourished in 2030,” it says. In fact, the current rate of progress would not even be enough to eradicate hunger by 2050. Given the limited scope for expanding agriculture’s use of more land and water resources, the production increases needed to meet rising food demand will have to come mainly from improvements in productivity and resource-use efficiency. However there are worrying signs that yield growth is levelling off for major crops. Since the 1990s, average increases in the yields of maize, rice, and wheat at the global level generally run just over 1 percent per annum, the report notes. To tackle these and the other challenges outlined in the report, “business-as-usual” is not an option, The Future of Food and Agriculture argues. “Major transformations in agricultural systems, rural economies and natural resource management will be needed if we are to meet the multiple challenges before us and realize the full potential of food and agriculture to ensure a secure and healthy future for all people and the entire planet,” it says. “High-input, resource-intensive farming systems, which have caused massive deforestation, water scarcities, soil depletion and high levels of greenhouse gas emissions, cannot deliver sustainable food and agricultural production,” adds the report. The core challenge is to produce more with less, while preserving and enhancing the livelihoods of small-scale and family farmers, and ensuring access to food by the most vulnerable. For this, a twin-track approach is needed which combines investment in social protection, to immediately tackle undernourishment, and pro-poor investments in productive activities — especially agriculture and in rural economies — to sustainably increase income-earning opportunities of the poor. The world will need to shift to more sustainable food systems which make more efficient use of land, water and other inputs and sharply reduce their use of fossil fuels, leading to a drastic cut of agricultural green-house gas emissions, greater conservation of biodiversity, and a reduction of waste. This will necessitate more investment in agriculture and agrifood systems, as well as greater spending on research and development, the report says, to promote innovation, support sustainable production increases, and find better ways to cope with issues like water scarcity and climate change. 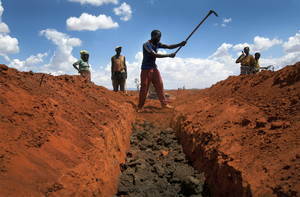 Along with boosting production and resilience, equally critical will be creating food supply chains that better connect farmers in low- and middle-income countries to urban markets — along with measures which ensure access for consumers to nutritious and safe food at affordable prices, such as such as pricing policies and social protection programs, it says.